Liver and pancreatic cancers represent areas of important unmet medical need. In 2018, more than 42,000 patients were diagnosed with liver cancer, the majority of whom had advanced disease not amenable to curative resection.1 Despite decades of advances and the introduction of multiple localized and targeted therapies in recent years,2 more than 30,000 patients succumbed to liver cancer.1 The situation for pancreatic cancer is even more urgent. More than 55,000 patients were diagnosed with pancreatic cancer in 2018, and more than 44,000 patients died from this malignancy.3 Fewer than 1 in 10 patients diagnosed with pancreatic cancer survive at least 5 years,3 and this falls to 1 in 20 for patients with unresectable disease.4 Only approximately 10% of pancreatic cancer cases are diagnosed at a stage when potentially curative resection is possible, and the cancer is generally very aggressive and places a heavy symptom burden on patients as the disease progresses.4 OncoSec’s new VLA platform has the potential to change the treatment paradigm for these patients by delivering potent immunotherapy directly to the tumors and potentially increasing their responses to existing standard of care (eg,checkpoint inhibitor therapy). EP is a physical transfection method that uses an electrical pulse to create temporary pores in cell membranes through which substances like nucleic acids can pass into cells. It is a highly efficient strategy for the introduction of foreign nucleic acids into many cell types. During the period when cells are exposed to a brief pulse of energy, the cell membrane becomes highly permeable to exogenous molecules, which pass through pores in the cell membrane (a process known as transfection). The electrical pulse is at an optimized voltage and lasts only a few microseconds to a millisecond. This disturbs the cell membrane, which is an ionized phospholipid bilayer, and results in the formation of temporary pores in this cellular barrier. The electric potential across the cell membrane simultaneously rises, allowing charged molecules like DNA plasmids to be driven across the membrane.5 The energy for EP is typically applied using an electrode applicator, which can have microneedle electrodes, and an electrical pulse generator (in the case of OncoSec’s technology). Needle electrodes enable EP to be performed in vivo,6 allowing for potential medical application. OncoSec uses EP as a microinjection technique to transfect millions of cells with specific components—immunologically relevant and important components of choice—in order to program the patient’s own cells to make these agents on a prolonged basis. OncoSec’s cancer researchers recognized the distinct advantages of EP and translated it into a powerful tool to deliver potent immunomodulatory agents to treat cancer. As described above, the clinical use of EP entails depositing exogenous molecules in the area surrounding cells. During the momentary cell membrane destabilization induced by the externally applied electrical field, the exogenous molecules can pass through membrane pores and, once the electrical field ceases, these molecules are trapped inside the cell. OncoSec’s cancer researchers have used plasmid-based DNA, coded to produce immunomodulatory proteins, and then deposited the DNA in the areas surrounding a cell. Once inside the cell, the DNA plasmids co-opt the cell’s function to cause it to make or “express” the immunomodulatory protein. This sequence can be carried out in millions of cells at once, causing sustained intracellular release of the immunomodulatory protein. OncoSec’s use of EP capitalizes on its inherent ability to efficiently transfect a diversity of exogenous molecules into a wide selection of cell types by a noninvasive, nonchemical method that does not negatively alter the biologic structure or function of the target cells. Over the past several years, OncoSec has developed its therapeutic platform to deliver cancer immunotherapies via the EP of plasmid DNA to use a cancer patient’s own tumors to produce a potent yet safe immunotherapy. This causes sustained intracellular release of immunologically relevant proteins, such as the proinflammatory cytokine interleukin (IL)-12. IL-12 is well known to transform immunosuppressed tumors into immunologically active lesions via coordinated innate and adaptive immunity. To date, OncoSec has developed several different types of DNA plasmids that encode immunologically relevant genes, such as its investigational human IL-12 (tavokinogene telseplasmid, or TAVO™). Using OncoSec’s proprietary therapeutic platform described above, TAVO is injected into a lesion and expressed through EP pulses. Transfected cells then express and secrete IL-12 protein, which initiates both local and systemic immune responses. Derived from significant multitumor clinical trial experience, OncoSec’s current investigational TAVO is tumor agnostic and independent of tumor histology, genetic, and/or immunologic status, making it a viable therapy across numerous tumor indications, including, importantly, internal tumors. Previously, OncoSec limited the use of its platform to treat cutaneous and subcutaneous tumors. However, with the engineering advancements described below, OncoSec has now enhanced its platform to treat lesions beyond cutaneous and subcutaneous tumors, thereby broadening the impact of its platform. OncoSec has developed proprietary novel applicators and generators that allow for EP of a wide array of immunologically relevant genes into cells located in visceral lesions, which are tumors located inside the body, including gastrointestinal (GI) tumors, pancreatic tumors, and hepatocellular carcinomas (HCC; the “VLA”). For example, the relevant immune mechanisms associated with clinical progression of HCC include increased tumor-infiltrating regulatory T cells (Tregs) and M2-polarized tumor-associated macrophages (TAMs), which can establish immune suppression both in the tumor microenvironment and peripherally. This immunoinhibitory network, when complexed with additional tumor-intrinsic suppressive mechanisms, has posed a significant challenge to meaningful treatment modalities. However, the emergence of anti-programmed cell death protein 1/ligand 1 (PD-[L]1) therapies, particularly in combination with locoregional therapies that can target these suppressive barriers, may provide meaningful clinical benefit. OncoSec’s intratumoral IL-12 EP platform not only enhances anti–PD-(L)1 activity (currently treating anti-PD-1–refractory melanoma patients with pembrolizumab [Keytruda®] plus its investigational TAVO in the KEYNOTE-695 study) via recruitment of functional T cells and the induction of adaptive resistance in the tumor microenvironment, but also critically modulates the ratio of CD8+ tumor-infiltrating lymphocytes (TILs) to Tregs as well as M2 macrophages, making this combination especially attractive in this tumor setting. OncoSec is focused on developing its VLA in the most expedient manner while complying both with US Food and Drug Administration (FDA) guidelines and OncoSec’s design control standards. The prototype concepts shown in Figures 1–3 have been developed on the basis of OncoSec’s miniaturization engineering experience in order to conduct preclinical evaluation of its other plasmid-based immunotherapeutics in small animal models. 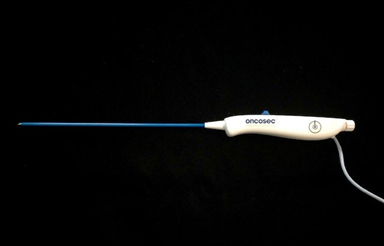 With product development expediency and preclinical efficacy in mind, OncoSec is leveraging miniaturizationconcepts, engineering, and distal geometry it developed and currently uses with respect to its preclinical applicator for the development of its VLA. This is advantageous because the large body of preclinical data will directly support the transition of the VLA development for clinical approval. Specifically, OncoSec’s preclinical studies utilizing a miniaturized 2-needle applicator with an electrode width of 1.5 mm (similar to the non-expanded VLA applicator) yielded IL-12–dependent tumor regression in a difficult-to-treat experimental nodal metastasis model using CT26 colorectal tumors. These preliminary data, coupled with a large body of preclinical studies in multiple tumor models utilizing a 0.5-cm 2-needle applicator, firmly establish the feasibility of moving this miniaturized VLA toward the clinic. While the preclinical applicator designs with distal end geometry equal to the prototype VLAs exist and are currently used in OncoSec’s preclinical studies, OncoSec is focused on developing and preparing its proprietary VLA prototypes featured in Figures 1–3 for preclinical safety and feasibility studies. As evident from the photographs, while much of the VLA design work is now complete, there are additional design control activities occurring, with anticipated completion allowing for feasibility studies in 2019. These feasibility studies will allow OncoSec’s development team to gain valuable data, which will result in additional VLA design enhancements. After introduction of the design enhancements, the remaining development activities include standard verification and validation, packaging development, and product sterilization studies. OncoSec’s GI-focused VLAs, illustrated in the figures below, have been developed as either a flexible catheter-based applicator (Figures 1a and 1b) or a more rigid trocar-based applicator (Figure 3). The catheter-based applicator includes a flexible body that, with a diameter of 2 mm, is sized for passage through currently available endoscopes, bronchoscopes or laparoscopes. For example, an endoscope can be positioned through the mouth into the stomach/small intestine, where OncoSec’s flexible VLA can be guided into pancreatic lesions, for sequential plasmid injection and EP. The flexible body has a length of approximately 100 cm to allow for navigation toward the target lesions via an endoscope or laparoscope, depending on the application and/or tumor indication. Once the distal tip of the VLA is properly positioned at the tumor site, the therapeutic plasmid is delivered into the lesion via an injection needle housed in the VLA. The co-localized electrodes can then transfer the electrical pulses into the tumor via OncoSec’s foot pedal-controlled generator. These electrical pulses allow for transfection of the plasmid into the tumor cells and the subsequent local secretion of the immune-activating cytokine (Figure 2). A second type of VLA (Figure 3) can also access visceral tumors, but with a slightly different approach. This trocar needle-based VLA includes a rigid body that, with a diameter of 2 mm and a length of 20 cm, is capable of directly entering soft tissue directly with open or laparoscopic surgery, with ultrasound or computed tomography (CT) guidance to the target lesion. Like the catheter-based VLA, the rigid trocar-based VLA is operated with an ergonomic handle at its proximal end. Also like the catheter-based VLA, the distal end of the rigid body includes a similar central localized injection needle flanked by dual electrodes having a retracted, compact position and a deployed, expanded position. Unlike the catheter-based VLA, the trocar-based VLA accesses a visceral tumor using a minimally invasive transcutaneous approach, which can be particularly useful for treating liver lesions. When the distal end of the rigid body reaches the tumor site, the electrodes and the injection needle are actuated to the deployed position and the plasmid is administered, followed by application of the electrical pulses from the generator via a foot pedal for delivery of the therapeutic EP. The minimal design of the VLAs helps reduce their “clinical footprint,” and their relative usability, either directly or in combination with common endoscopes and laparoscopes, makes them ideal to address different unmet medical needs in GI-based cancers. These novel VLAs will introduce OncoSec’s successful immunotherapeutic platform to visceral tumor indications, extending the clinical impact of this powerful cytokine-based therapy. On the basis of its initial research, OncoSec intends to utilize the trocar-based VLA to access primary tumors in patients who have unresectable HCC tumors. While HCC patients do present with tumors that appear resectable, often their underlying liver disease (i.e., cirrhosis) excludes these patients as candidates for surgical resection or transplant. For these patients, who represent approximately 70% of the newly diagnosed HCC patients in the Western world, treatment options are limited to transarterial chemoembolization (TACE), radioembolization, and systemic therapy,9 with many being referred directly to hospice without any intervention. The ability to access these lesions intratumorally with a potent immunotherapy could shift the treatment paradigm for these patients. The trocar-based VLA discussed is sufficiently miniaturized to pass through the central lumen of a percutaneous needle commonly used for liver biopsies. This approach allows for the procedure to be done in an interventional suite utilizing CT-guided imagery. While the applicator is configured for use in a laparoscopic procedure, the percutaneous approach has several advantages. It minimizes the need for general anesthesia and allows the procedure to be repeated on a weekly basis, if dosing regimens so demand.. The device is also configured for use with an endoscope, allowing for a transgastric approach. While this may be attractive for disease located in the left-hand portion of the liver proximal to the stomach, disease distal from the stomach would require a percutaneous or laparoscopic approach. The versatility of the device would facilitate broad usage potential with surgical, radiologic, and endoscopic applications using a single generator and delivery system. The OncoSec technology provides key potential advantages over conventional liver-directed therapy. Microwave ablation and RFA are limited in that they are only useful for relatively small tumors. Furthermore, some lesions cannot safely be treated with ablation due to proximity to critical structures such as major vascular structures and central bile ducts. The heat associated with ablation is an inherent limitation to microwave and radiofrequency ablation. Chemoembolization and radioembolization require adequate liver function. So many patients with inoperable HCC cannot be treated with ablation, or other liver directed therapies due to anatomic or liver function concerns. Percutaneous treatment options for primary liver tumors, including ablation with radiofrequency currents (RFA), microwaves, or freezing (cryoablation), are typically limited to early disease stages, with the hope of ameliorating the disease before it metastasizes.10 For example, microwave ablation uses a probe to deliver thermal pulses to the malignant tissue, resulting in an ablation zone. Microwave ablation is seen as an improvement over RFA in its ability to target larger-sized lesions. However, a recent study found that although there was a very low rate of recurrence of the treated lesions, new liver lesions developed in 72% of patients with liver lesions smaller than 4 cm treated with microwave ablation.11 Therefore, microwave ablation effects appear limited to the treated lesion. This has also been demonstrated for other localized approaches, such as embolizing radiotherapy microspheres.12 In contrast, rather than directly ablating tumor cells, the TAVO technology has the potential to transiently turn these lesions into cellular factories for immunostimulating cytokines,13 which can work in concert with other immunotherapies such as checkpoint inhibitors. As illustrated in patients with anti-PD-1–refractory melanoma being treated with TAVO and pembrolizumab in KEYNOTE-695, tumor responses can occur not only in the treated lesion, but also in distant sites.14 Therefore, TAVO is a localized therapy that can mediate systemic anticancer effects. The VLA and generator are to enter the clinic using the current TAVO formulation under a new Investigational New Drug (IND) application. The first step in the investigation of TAVO for use in treating internal tumors, including liver and pancreatic lesions (primary and/or metastatic), is to submit a new IND application. The new generator is being used preclinically and will be available for clinical use in the first half of 2019. The changes to the drug-delivery system will be the advanced VLA and OncoSec’s next-generation generator. OncoSec believes that leveraging its experience with the current clinically available generator and VLAs and applying its preclinical knowledge about the new generator and VLA with its existing IL-12–based therapeutic would be an appropriate, streamlined approach. The rationale is as follows: TAVO has been under investigation in the clinical setting for approximately 6 years, with no systemic toxicities and with all but 2 adverse events (AEs) being grade 1 or 2. The two grade 3 AEs were cellulitis that easily resolved with antibiotic therapy. Because the existing clinical trial uses the current generator, the use of this new generator would not present any additional safety risk under a new IND. OncoSec does not believe that the VLA presents an additional risk, as it has been engineered to use lower voltage while increasing transfection efficacy. Prior to introducing this new IND, OncoSec intends to confirm with the investigational review board (IRB) that the VLA and generator do not present a significant risk to study participants. The VLA is not an implantable device, it is not life sustaining, and it is not of “substantial importance” in treating disease—it is a drug-delivery system. The generator functions on the same EP platform as the current clinical product, but instead uses a reduced amount of energy over a slightly longer therapeutic duration. OncoSec would also present to the IRB information concerning comparable technologies that are currently on the market and are classified as Class II devices subject to premarket clearance. Certain of these devices have been cleared for electrosurgical cutting and ablation (ie, irreversible EP), applications that appear to pose a higher risk than the investigational use of this advanced VLA. OncoSec will also perform standard engineering development activities ensuring that all safety measures are in place, including electrical safety testing of the generator and a biocompatibility evaluation for the new VLA, to ensure that the components and materials used are consistent with industry standards for medical devices. OncoSec will also conduct the requisite animal studies to confirm the operational and functional objectives of the VLA and generator. In terms of timing, once the IRB accepts review, with a determination that the VLA and generator do not present a significant risk, and the IND has been submitted to FDA, OncoSec may immediately proceed with new clinical studies. OncoSec has filed several patent applications on the various VLAs and is currently prosecuting applications related to the next-generation low-voltage generator, which provides for higher transfection efficiency on the premise that lower-voltage, longer-length pulses are more effective than higher-voltage, shorter-length pulses. The IP also covers a multitude of treatment methods with various therapeutics. In combination with the tumor-agnostic power of TAVO, the VLA platform is applicable to most internal tumor indications that can be accessed with an endoscope, bronchoscope, catheter, or trocar. Further, TAVO has already proven to show robust efficacy in difficult-to-treat patient populations, including metastatic melanoma refractory to checkpoint inhibitor therapy, as well as TNBC. Notably, TAVO demonstrated and continues to demonstrate a powerful abscopal effect. In its earlier phase 1 monotherapy trial, TAVO demonstrated a 46% response rate in untreated lesions in metastatic melanoma. After cancer has spread, curative resection is typically not possible. Consequently, there are approximately 23,500 new cases of unresectable liver cancer and 49,900 new cases of unresectable pancreatic cancer each year,1,2 a diagnosis typically associated with poor prognosis. Local treatment options are largely limited to ablative procedures, which do not seem to provide a significant benefit over standard of care and exhibit little to no meaningful abscopal effect. Local therapies for liver cancer are typically cytoreductive, not curative, in nature and typically do not have a major impact on the disease course overall. For example, a study comparing radioembolization with yttrium 90 (Y90) vs treatment with a targeted therapy, sorafenib, found that although Y90 treatment significantly delayed disease progression in the liver vs treatment with sorafenib, there was no survival advantage.8 Indeed, the rate of progression outside the liver was significantly greater with Y90 treatment vs sorafenib, and survival was shorter, although the difference did not reach statistical significance. The ability to directly inject these tumors with a potent cytokine and concurrently deliver that therapeutic via EP could result in meaningful treatment options for these patients. If TAVO can deliver a similar abscopal response in HCC as it does in metastatic melanoma and TNBC, it would truly transform the treatment paradigm in these difficult-to-treat malignancies. OncoSec’s next-generation delivery platform is applicable to any nucleic acid-based therapeutic or chemotherapeutic intended for intratumoral delivery (eg, bleomycin). This presents not only a short-term opportunity with TAVO, but also downstream licensing potential for any partner to license the technology platform to additional therapeutic-based companies. National Cancer Institute. Surveillance, Epidemiology, and End Results Program. Cancer stat facts: Liver and intrahepatic bile duct cancer. https://seer.cancer.gov/statfacts/html/livibd.html. Accessed March 5, 2019. Llovet JM, Montal R, Sia D, Finn RS. Molecular therapies and precision medicine for hepatocellular carcinoma. Nat Rev Clin Oncol. 2018;15(10):599-616. National Cancer Institute. Surveillance, Epidemiology, and End Results Program. Cancer stat facts: Pancreatic cancer. https://seer.cancer.gov/statfacts/html/pancreas.html. Accessed March 5, 2019. Balaban EP, Mangu PB, Yee NS. Locally advanced unresectable pancreatic cancer: American Society of Clinical Oncology Clinical Practice Guideline summary. J Oncol Pract. 2017;13(4):265-269. ThermoFisher Scientific. Electroporation. https://www.thermofisher.com/us/en/home/references/gibco-cell-culture-basics/transfection-basics/transfection-methods/electroporation.html. Accessed March 5, 2019. Luft C, Ketteler R. Electroporation knows no boundaries: The use of electrostimulation for siRNA delivery in cells and tissues. J Biomol Screen. 2015;20(8):932-942. Chang D, Chassy B, Saunders J, Sowers A, eds. Guide to Electroporation and Electrofusion. 1st ed. San Diego, CA: Academic Press, Inc.; 1992. OncoSec Immunotherapies. Pipeline. 2018. https://oncosec.com/pipeline/. Accessed March 5, 2019. Lencioni R, Chen XP, Dagher L, Venook AP. Treatment of intermediate/advanced hepatocellular carcinoma in the clinic: How can outcomes be improved? Oncologist. 2010;15(suppl 4):42-52. Couri T, Pillai A. Goals and targets for personalized therapy for HCC. Hepatol Int. 2019. https://doi.org/10.1007/s12072-018-9919-1. Accessed March 5, 2019. Violi NV, Duran R, Guiu B, et al. Efficacy of microwave ablation versus radiofrequency ablation for the treatment of hepatocellular carcinoma in patients with chronic liver disease: a randomised controlled phase 2 trial. Lancet Gastroenterol Hepatol. 2018. https://doi.org/10.1016/S2468-1253(18)30029-3. Accessed March 5, 2019. Vilgrain V, Pereira H, Assenat E, et al. Efficacy and safety of selective internal radiotherapy with yttrium-90 resin microspheres compared with sorafenib in locally advanced and inoperable hepatocellular carcinoma (SARAH): an open-label randomised controlled phase 3 trial. Lancet Oncol. 2017;18(12):1624-1636. Canton DA, Burkart C, Shirley SA, et al. Intratumoral delivery of a P2A-linked bicistronic IL-12 construct leads to high intratumoral expression and systemic anti-tumor response. Cancer Res. 2017;77(13 suppl): abstract 1614. Gargosky SE, Atkinson V, Haydon A, et al. Initial report of intratumoral tavokinogene telseplasmid with pembrolizumab in advanced melanoma: an approach designed to convert PD-1 antibody progressors into responders (NCT03132675). Presented at: Society for Immunotherapy of Cancer 33rd Annual Meeting; November 7–11, 2018; Washington, DC. Poster 717/Abstract 11375. 15. US Food and Drug Administration. Drugs. FDA grants accelerated approval to nivolumab for HCC previously treated with sorafenib. 2017. https://www.fda.gov/Drugs/InformationOnDrugs/ApprovedDrugs/ucm577166.htm. Accessed March 5, 2019. US Food and Drug Administration. Drugs. FDA grants accelerated approval to pembrolizumab for hepatocellular carcinoma. 2018. https://www.fda.gov/Drugs/InformationOnDrugs/ApprovedDrugs/ucm625705.htm. Accessed March 5, 2019. OncoSec Immunotherapies. Press releases. OncoSec provides KEYNOTE-695 clinical update and outlines 2019 milestones. 2019.